Several physical and operation constraints limit the maximum number of trains that can be operated at various points in the Metrorail System. Merging at major line junctions, such as the Orange/Silver and Blue Line merge at Rosslyn, are potential sources of delay, similar to a freeway on-ramp. “Slot-swapping”, where trains diverge from one line and then merge with another, such as the Yellow Line which shares track with both the Blue and Green Lines, can cause a train to miss its scheduled slot on the other line. Close station spacing limits optimum train speed to account for a berthed train ahead, slowing the approach of following trains. Transfer station dwells limit train throughput as trains wait for large volumes of passengers to board and alight, which can be exacerbated by variable length trains. Terminals, both in the mid-line (such as Mt. Vernon Square) and beyond end-of-line stations (such as Greenbelt), limit throughput as trains change direction, which may require more time than the scheduled headway. When compared to other North American heavy rail systems, Metrorail scores high marks vs its peers in maximum achieved railcar throughput, and the degree to which the configuration of its tracks and train control design supports high capacity operation. Although junctions can introduce delays, Metro’s junctions, curves, and other track elements were engineered for relatively high speeds, while its train control system – which keeps trains safely spaced apart – was designed to permit a wide array of speed limits that closely match the design speeds of the tracks. This combination keeps trains moving quickly through the system. Metrorail scores less favorably in dwell times due to high passenger volume in the system core, variable-length trains, and lack of full-time Automatic Train Operation (ATO), which improves operational consistency but hasn’t been in use system-wide since 2009. As we noted before, core station dwell times are a key capacity constraint, and Metro has seen these increase in the past decade or so with 90th percentile dwell times exceeding one minute on the Red Line at both Metro Center and Gallery Place. Although running all 8-car trains would improve the distribution of passengers on platforms, funding for this effort is not currently available. It is estimated that a return to full-time ATO and deployment of a railcar with four doors per side (only if operated exclusively along a line) could each increase throughput by a modest 1-2 trains per hour. Although it was not discussed in the paper, operating open gangway railcars would increase person throughput by opening space between cars to passengers. Finally, several transit agencies are installing moving block, or Communications-Based Train Control (CBTC) systems, in an effort to upgrade old equipment, or improve reliability and capacity. 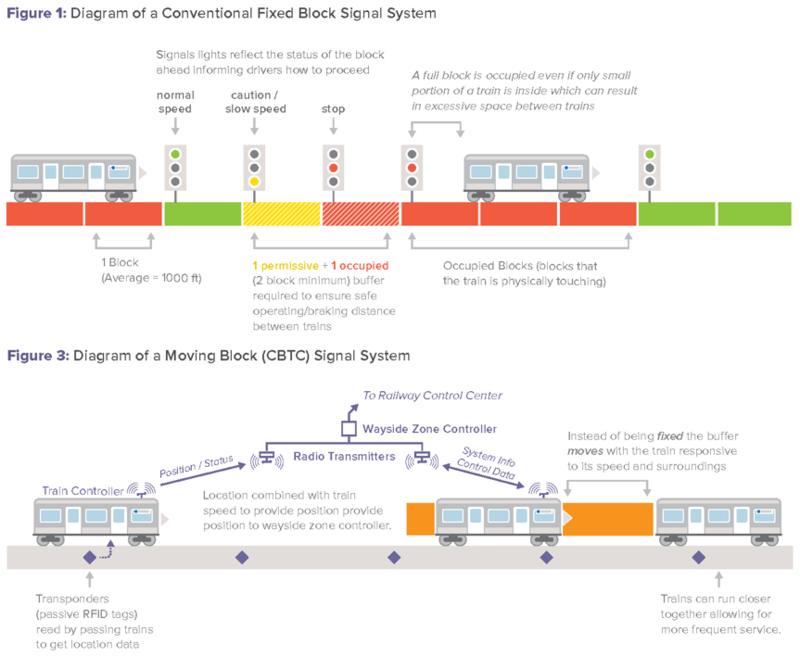 While conventional train control systems use track circuits placed at regular intervals called “blocks” to locate trains, CBTC systems can improve the accuracy of train positions by allowing trains to communicate to one another indirectly, allowing them to operate closer together. But would this increase Metrorail’s capacity? To find out we conducted simulations on the core of the Blue/Orange/Silver Line corridor. This revealed that our existing train control system has very short fixed blocks (as short as 200 feet) and permits many speed limits, which allows close train spacing and limits the positional accuracy gains that a CBTC system might provide. When combined with CBTC’s communication latency between successive trains, the CBTC system was estimated to increase maximum throughput by only about one train per hour. Given that CBTC systems can cost hundreds of millions of dollars, the benefits may not be worth the costs. Did you learn anything new from this post? 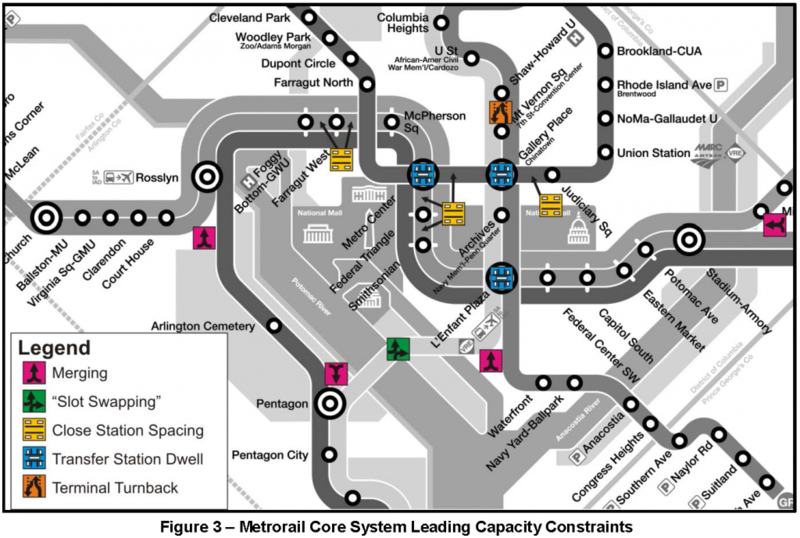 The bigger issue is Metro running miles of underutilized service out to the ends of lines. More working turnbacks, that were used, would greatly increase the efficiency of Metrorail. Metrorail has high loading for short distances, primarily through downtown. Meeting the service requirements for these area without using turnbacks results in underutilized car miles which show up in comparisons with Metro’s peers. The problem, of course, is the caveat “– when in a state of good repair –”. That is a purely theoretical concept at this point, considering we have no real idea when the system will be in good repair, or if it will stay that way. Well.. that is simply a lie (that DC metro was designed for high performance). Russian metro (as I am from there), for example, operates more than 60 trains per hour per line during rush hour (40-second intervals). And they started building it decades earlier, btw. Enjoyed your post. Does Metro make available public delay data by line? Additionally, I’ve heard of plans to shut down the Blue/Yellow lines between Braddock Road and Crystal City. Since there are already transit alternatives in that vicinity, instead of a pure shuttle replacement, why not advertise Metroway as an alternative way to meet back up with the Blue/Yellow at CC? This might reduce the costs associated with organizing a shuttle route, and it will give an excuse for people to try Metroway out, and see if it fits for them. Additionally, WMATA could partner with VRE to allow free transfers onto their trains during rush periods, as VRE stops at both King Street-Alexandria and CC, as well as continuing on to L’Enfant Plaza, where all lines except the Red stop. This will allow people to try out different modes of transit, some of whom may choose to stick with either VRE or Metroway, as it fits better for them. By the same token, the scheduled track work on the aforementioned section, could include the widening of the tracks near the proposed site of the Potomac Yard in-fill station, making it easier to continue running service through that area, even when the station is still under construction (if approval is given to proceed). However, there are plans to add a fourth track to the CSX main-line between L’Enfant Plaza VRE and the “Eisenhower Valley junction,” where the tracks to Richmond and the tracks to Charlottesville split. Try to coordinate with the stakeholders of that project (Southeast High Speed Rail’s DC-to-Richmond Project), to make best use of the existing ROW between National Airport and Braddock Road. Apologies, it was indeed wordy.